Anyone familiar with the experience of visiting a Disney park will tell you that a lot of the day’s fun will be sucked up by having to stand in lines to do (and buy) just about anything. On top of all that, if you’re traveling to your destination, you must plan well in advance to ensure you have everything in place: a booked hotel room, the tickets are purchased, spending money is set aside, food and snack budgets generated, etc. Once you’re there, you also have to plan your day(s) so you can see and do everything you want. 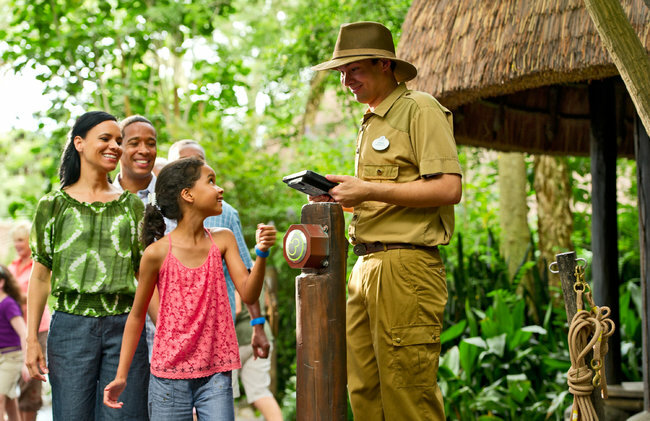 Over the years, Disney has been great at providing the latest and greatest in technology and service aimed at enhancing and speeding up processes at their theme parks. At Walt Disney World in Florida, they have streamlined almost everything by creating somewhat of a miniature community just for their guests. But even with transportation between parks, passes that get you into every theme park, FastPass on select rides and even Disney currency, they are still going a step further. By spring of this year, Disney park-goers will be able to handle many of the mundane transactions using only a fancy wristband. On paper, this sounds amazing. Imagine not having to wait in line to buy tickets. Imagine never having to get a physical FastPass again. Imagine never having to remember you room key. In fact, with the new MyMagic+ system, you wouldn’t even need to remember to bring your money! All of you personal information is stored on this bracelet and can be accessed simply by tapping it to the ticket machine, cash register, FastPass dispenser and your hotel room. Amazing it might be, but scary it is as well. It’s bad enough losing a cell phone loaded to the brim with personal information, contacts, emails, photos and more, but now we have to worry about losing our little magic bracelet too? Disney claims they are aware of the privacy concerns and has stated they have measures in place to not only protect that privacy from prying eyes, but also to restrict it from Disney itself. For example, one of the features would allow children’s names and basic information such as a birthday to be encoded into the wristband allowing character meetings to be far more personal than ever before, but parents can opt out of this feature. No longer would Snow White have to ask for a name…she can now receive this information via the wristband. I’m assuming this would still have to be voiced to her by another cast member through an earpiece or something, but the kids will be amazed nonetheless. Right now, this technology is being brought only to Walt Disney World, but if proven successful, will no doubt be in every Disney theme park worldwide. From there, it should move to just about every other theme park as well. Disney is at the helm of the theme park industry bringing in some $12.9 billion annually and any change they make in the way they do business is sure to change the way others do it as well. It’s no secret in business that knowing what your consumers want and need is the main ingredient of success, however many consumers don’t offer this information up freely or some businesses never ask. At Disneyland here in California, exiting guests can always expect to see those iPad-holding cast members asking all sorts of mundane questions such as, “How many rides did you go on today?” While they seem irrelevant to us, Disney uses this information to find out how guests are using their parks. With the MyMagic+ system in place, they no longer have to ask…the bracelets will be able to tell them EVERYTHING. Much if this information is likely going to be anonymous—things like how long you waited in line for rides, how often you stopped to take a break and how many churros you ate are not required to be linked to any specific person, but the question will always be in people’s minds…how much of my personal information is out there? Disney says the bands themselves do not contain any personal info. So it seems that the band would be just a unique identifier that connects to the system and then retrieves info as needed. They went on to say that a pin number would be required for purchases over $50 and the bands could also be deactivated by a cast member or via the smartphone app should one become lost. These features should ease the minds of those who fear the loss of theft of such a device. For as many fears that this technology brings to light, there are just as many pleasantries. Disney plans to eliminate the turnstiles at the front gates because you would only need to tap your wristband on a small pole when walking in. They can remove the FastPass system entirely and move it to the smartphone app so you can reserve a FastPass at any time. They can alter their workforce to be more efficient during busy times, while saving money when it’s slow. As a well-versed Disney Annual Passholder, I can say the benefits from this system will trickle down to everyone. While it won’t reduce the amount of people still in the parks, it will allow me to customize my day around the crowds. In time, I hope that Disney will use the statistical data from this system to better inform all guests of the best times to do things as well is NOT to do things. I also imagine that MyMagic+ will be able to generate almost perfect wait times for the signs at the beginning of each ride. I’m an advocate of protecting personal information, but I’m also a huge fan of streamlining processes. If Disney can uphold their end of the bargain by protecting customer data, this could be the biggest shift in business Disney parks have ever seen! There’s not mention if the bracelets are going to be re-usable or just a crappy throw-away device, but I can bet that Annual Passholders would be able to buy a more permanent solution…perhaps even some custom design that can be personalized and possibly even fashionable. We already carry our passes on us anyway…we might as well put it on our arm, right?! We have yet to see what a full implementation of this system looks like, but so far it looks like a good move on Disney’s part. ← FISA Amendments Act Could Pass – Should We Be Worried?